Van-de-Graff Generator :- All improved version over whimshirt machine showing its filled effect from a longer distance Collecting sphere is removable to show the construction details. Fitted on wooden base with hand rotation wheel and connection in earth new design. Motor : Operates on 220V A.C. 50Hz. Spheres : Aluminium 16.5 cm. diameter approx. Voltage : 250 KV under dust free atmospheric conditions corresponding to a spark discharge of 7 cm. Motor: Operates on 220V A.C. 50Hz. Spheres: Aluminum 16.5 cm. diameter approx. Van De Graff generatorFor producing high voltage electricity for a wide array of electrostatic experiments with complete & full accessories. REMOVABLE PERFECT DOME FOR EASY ACCUMALTION OF CHARGE AND ILLUSTRATION OF CONCEPT. The low voltage powered model. Power input is via a pair of color coded 4mm sockets. Mains operated versions are provided with 1.5 meters of 3 core mains cable. The earth core of the mains leads being connected to the metal structure of the apparatus. Both voltage & mains versions also have independent 4mm earth sockets with discharger of 75mm dia with handle. 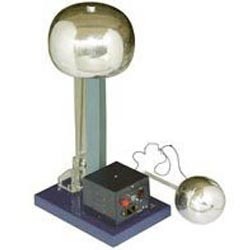 Offer Ven De Graff generator hand driven and motor driven both type. Best quality and most competitive rates. Designed for electrostatic experiments and where continuous source of high voltage is required.